Washington High School Interactors like to get their hands dirty on the weekend, especially if it is digging and planting in their favorite spot: Growing Together: A Giving Garden. 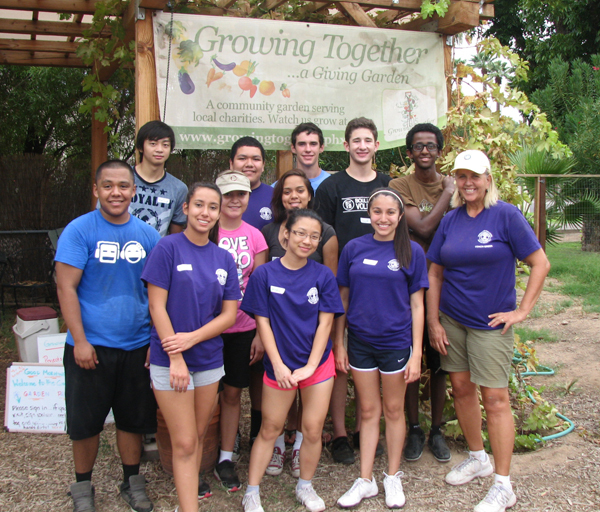 The community garden located at 2nd Street and Glendale Avenue, grows food for those in need in the community. The garden has set up an Adopt a Bed program where a group plants and nurtures a plot through the season and 90 percent of the harvest is donated to those in need. “We typically have 20-25 families and groups adopting a bed each planting season. All donations support our watering needs, supplies, seedlings and seeds,” says garden volunteer coordinator, Judy Walden. “We are excited about learning to take care of another crop this season,” Green said. “Last season we had fun with our pepper bed and all that went with making it a successful harvest.” This year the team will be planting broccoli in their bed. Interact is sponsored by Sun City Rotary and has 250 members who complete over 60 events each year. Growing Together . . . a giving garden began as a vacant lot in November 2009 and has harvested over 4000 pounds of food, graciously received 1800 hours of volunteer service hours and serves 4 local shelters and needy organizations who typically go without fresh fruits and vegetables. For more information check out our website: http://www.growingtogetherphx.org and come visit us and help us continue to grow!